Dungeons & Dragons Legends of Baldur's Gate is the latest licensed Dungeons & Dragons (D&D) comic book from IDW Publishing. This new comic book series is written by Jim Zub and drawn by Max Dunbar with colors by John-Paul Bove and letters by Neil Uyetake. Apparently, Baldur's Gate is a fictional city in the Forgotten Realms campaign setting of the D&D fantasy role-playing game (RPG). I say “apparently” because it has been decades since I have read a D&D comic book or even played the game. Baldur's Gate is located in the Faerûn region and is a coastal city on the north bank of the river Chiontar. It is “a place of history and a home to legends.” Dungeons & Dragons Legends of Baldur's Gate #1 (“Part One”) opens in the Upper City where a young female moon elf, Delina the Wild Mage, is on the run from two flying, stone gargoyles. 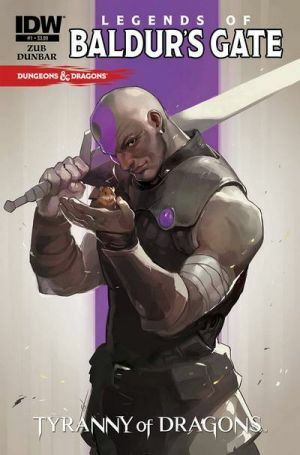 Her magic is not enough to stop them, but Minsc, a tall, imposing figure of a man, comes to her rescue. He has a pet, Boo the hamster, and insists on calling Delina by the name, “Neera.” She will accept the hamster and the new name, if Minsc can help her find her missing brother. THE LOWDOWN: Simply put, Dungeons & Dragons Legends of Baldur's Gate #1 is the kickoff of a comic book adventure series. Specifically, it is a comic book narrative structured as if it were a D&D campaign. Writer Jim Zub grew up on D&D, as he writes in a “Welcome” essay at the end of this first issue, so the series may reflect what Zub loves about D&D. Legends of Baldur's Gate #1 is not a great comic book, but it does have an intriguing premise. And I have to be honest; I think I will always be interested in the idea of a D&D campaign. In this first issue, the story is straightforward, so artist Max Dunbar is not required to convey any complex storytelling. It is good enough and acceptable for Dunbar to draw big panels and splash pages because this story is three things: vague introductions of characters, fights, and chase scenes, which are big panel-ready story elements. POSSIBLE AUDIENCE: Readers of D&D comic books will want to try Dungeons & Dragons Legends of Baldur's Gate.